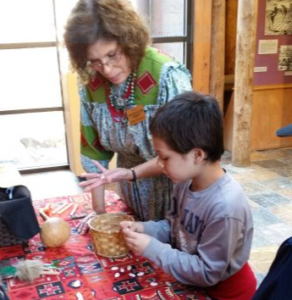 There is free admission on this special day when the Funk Heritage Center honors Georgia's first people during Native American Heritage Month. 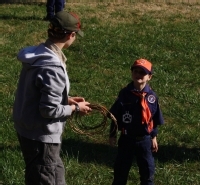 This is a great day for scouts of all ages to visit the Center and scouts in uniform will receive a free hot dog and drink. The Bennett History Museum will be open from 10 a.m. to 4 p.m. 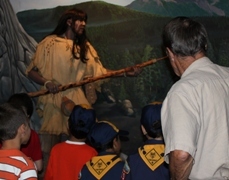 In the Hall of the Ancients, see 12,000 years of Southeastern Indian history in dioramas and exhibits that include artifacts from Cherokee County, Georgia. Docents will be in the Hall of the Ancients until noon to answer questions. Visitors may tour the museum galleries and see a 15-minute film about how Georgia's Native Americans lived before Europeans came. There will be games for children and other special activities including a special guest who may visit between 10:30 and noon. 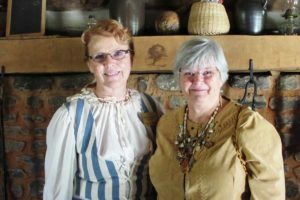 Weather permitting, from 10 a.m. until noon, in the Appalachian Settlement "pioneer settlers" will welcome visitors to an historic log cabin. Blacksmiths will be in their shop demonstrating their work. For those visitors who enjoy walking, the Appalachian Settlement is located a short walk behind the facility. 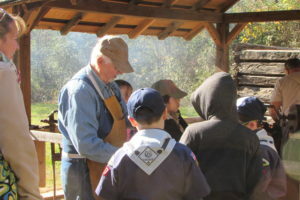 Pictured below, pioneer ladies in the cabin, a blacksmith shows Cub Scouts how he performs his craft, and a child is learning a Native American game. Local artifact expert Carl Etheridge will be available from 11:30 a.m. until 1:30 p.m. to identify Native American artifacts. No antiques will be appraised. At 1:30 p.m., W. Jeff Bishop, director of the Funk Heritage Center, will present a program about the Cherokee Removal in 1838. Bishop is an author of books about Cherokee history and was previously the president of the Georgia Chapter of the Trail of Tears Association. He is an authority on the Cherokee and relocation of Southeastern Indians to Indian Territory in Oklahoma. Adults and older children will want to take advantage of the opportunity to attend this free lecture. The Georgia Chapter of the Trail of Tears Association will hold their meeting in the Buffington Gallery from 10 a.m. until noon. Hot dogs and drinks will be sold from $1 each from 11:30 a.m. until they are gone. They are free to all scouts in uniform. Picnic tables are available for visitors who want to bring their lunch. 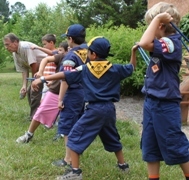 Pictured below, Cub Scouts played Native American games and learned about the Southeastern Indians from volunteer Bob Andrew.